CR2 - Female Inspired Design, Bold Tortoise Shell Polished Frame, Diamond Studs in Temples for the Female Touch, Clear Lens. You ask for it, you got it! A female inspired design that is fashion forward. The CR2 features a full dual lens design. 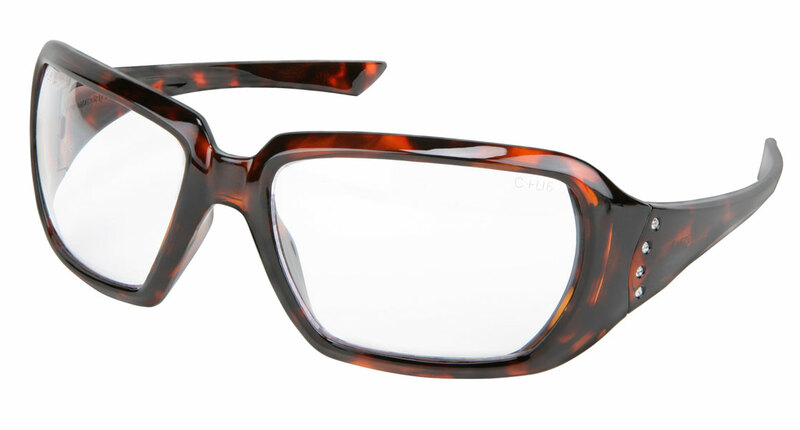 The CR2 is offered in two frame options, black/clear and tortoise shell with diamond like studs. The black/clear option has no removable parts, thus creating an excellent option for the food industry. CR2 - Female Inspired Design, Bold Tortoise Shell Polished Frame, Diamond Studs in Temples for the Female Touch, Brown Lens. CR2 - Female Inspired Design, Bold Tortoise Shell Polished Frame, Diamond Studs in Temples for the Female Touch, Indoor/Outdoor Clear Mirror Lens. CR2 - Female Inspired Design, Bold Tortoise Shell Polished Frame, Diamond Studs in Temples for the Female Touch, Gray Lens. CR2® - Female Inspired Design, Bold Black / Clear Polished Frame, Indoor/Outdoor Clear Mirror Lens. CR2 - Female Inspired Design, Bold Black / Clear Polished Frame, Clear Lens.